22 12月 What Is Scrap Metal Recycling? Scrap metal recycling involves the recovery and processing of scrap metal from end-of-life products or structures, as well as from manufacturing scrap, so that it can be introduced as a raw material in the production of new goods. Scrap metal recycling involves a number of steps such as recovery, sorting, brokering, baling, shearing, and smelting. Businesses may perform a number of such activities. The scrap metal recycling industry embraces the range of economic activities encompassed in scrap metal recycling. Scrap metal recycling is more environmentally friendly than extracting and processing virgin material, while also generating more jobs. Scrap Metal recycling is an activity undertaken by entrepreneurs such as scrap metal collectors, as well as by a range of companies large and small that in the aggregate, comprise the scrap recycling industry. The scrap metal industry is an important and well-established one, involving the recovery of metal generated from manufacturing scrap as well as most importantly from products after their useful life. Scrap metal recycling has many important benefits and plays a powerful role in supporting both environmental and economic outcomes. It is highly successful in diverting metal scrap from landfills, and provides the raw material for new products, offering a much lower carbon footprint and more efficient utilization of resources than new material. Aside from environmental benefits, metal recycling is an extremely powerful economic activity, generating over $64 billion to the U.S. in 2010, according to ISRI statistics. When talking about scrap metal recycling, it is important to differentiate between the two main categories of scrap metal: ferrous metal, and nonferrous metal. While ferrous metal contains some degree of iron (and in fact, its name is derived from the latin term meaning iron), non-ferrous metal does not contain iron as a component. Nonferrous scrap includes aluminum, copper, lead, nickel, tin, zinc and others. The collection of scrap metal is hierarchical, and can start with scrap metal collectors who pick up small quantities of scrap for sale to scrap yards, as well as many other scrap business roles. Community recycling programs, electronics recycling and larger commercial generators of scrap metal also provide other conduits of scrap. In terms of volume, ISRI estimated that United States recycles more than 73 million metric tons of ferrous metal was recycled in the U.S . in 2014. The largest source was provided by the 11 million automobiles which were recycled. While the volume of ferrous metals recovered is much greater, nonferrous metals generate more industry revenue due to their greater value, and as such are aggressively recycled. 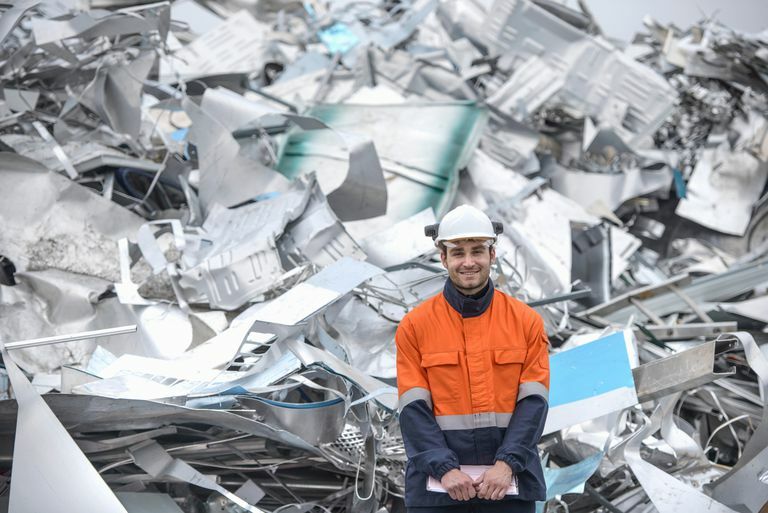 Recovered nonferrous scrap, including aluminum, copper, lead, nickel, tin, zinc and others, was valued at $40 billion in 2014, generating a volume of 7 million metric tons. Maintaining the recycling rate for predominantly consumer goods can be more challenging, such as in the case of aluminum beverage containers. Overall, the recycling rate for aluminum cans is only 58.1 percent (2011), yet in jurisdictions that have beverage container deposit laws, the recovery rate is much higher. For example, in British Columbia, which has a 5 cent deposit, the recovery rate was 83.5 percent (2010). Aside from the diversion of material from landfills, other important benefits of metal recycling versus the creation of virgin metal include a reduction in energy consumption as well as in the use of other materials. For example recycled aluminum requires 95 percent less energy, while copper needs 90 percent less, and steel 56 percent less. Additionally, the recycling of one ton of steel avoids the use of 2,500 pounds of iron ore, 1,400 pounds of coal and 120 pounds of limestone.